I was advised that some of the attendees for the Holiday Craft Bazaar had small children and babies, thus the fleece hats! 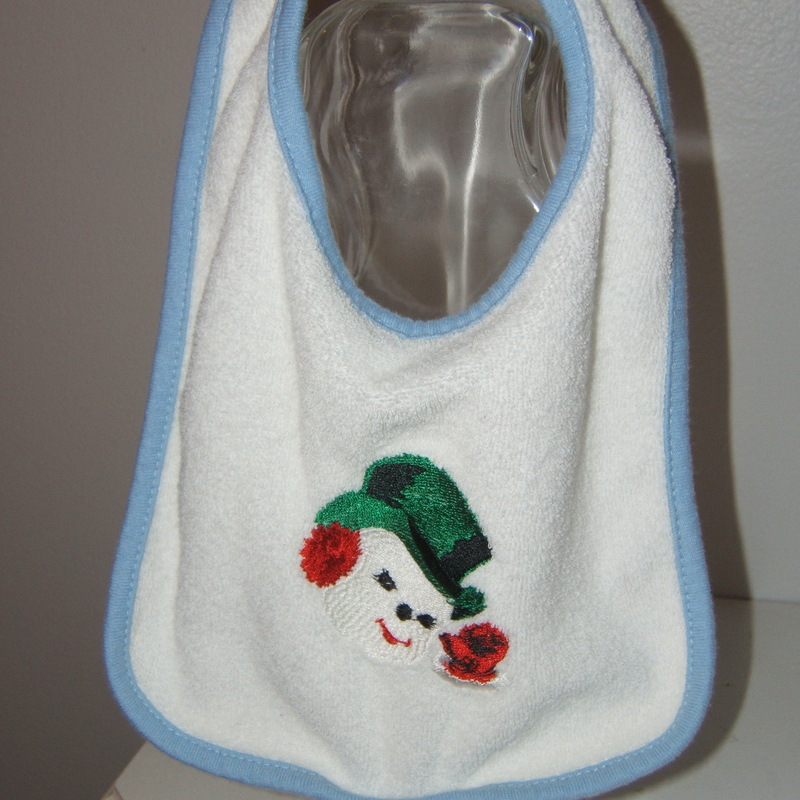 Well we can’t forget about the smaller set – infants. 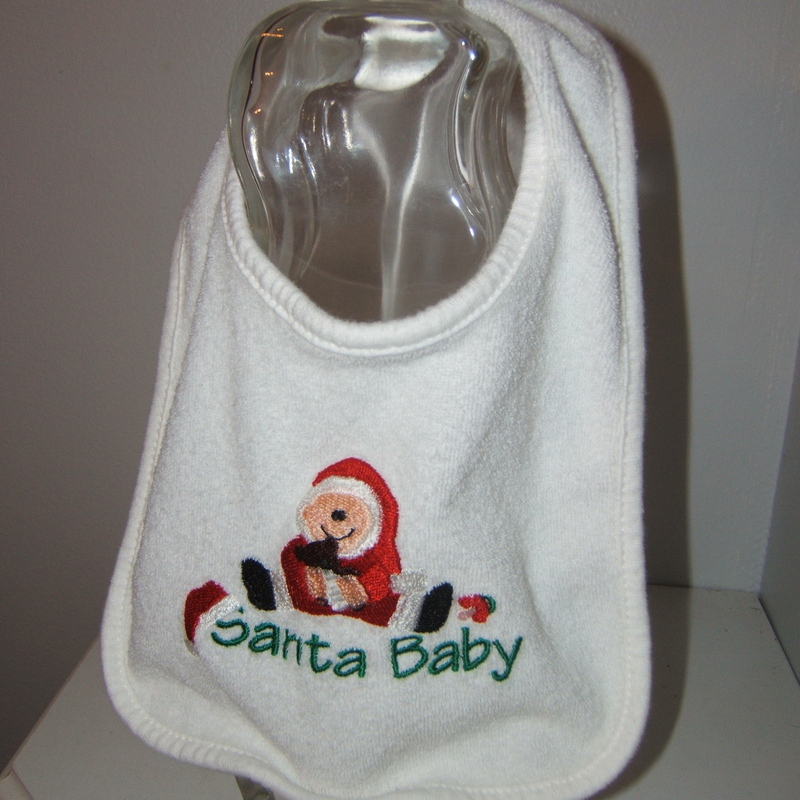 I did a bunch of Christmas bibs and they are in a previous post with photos. 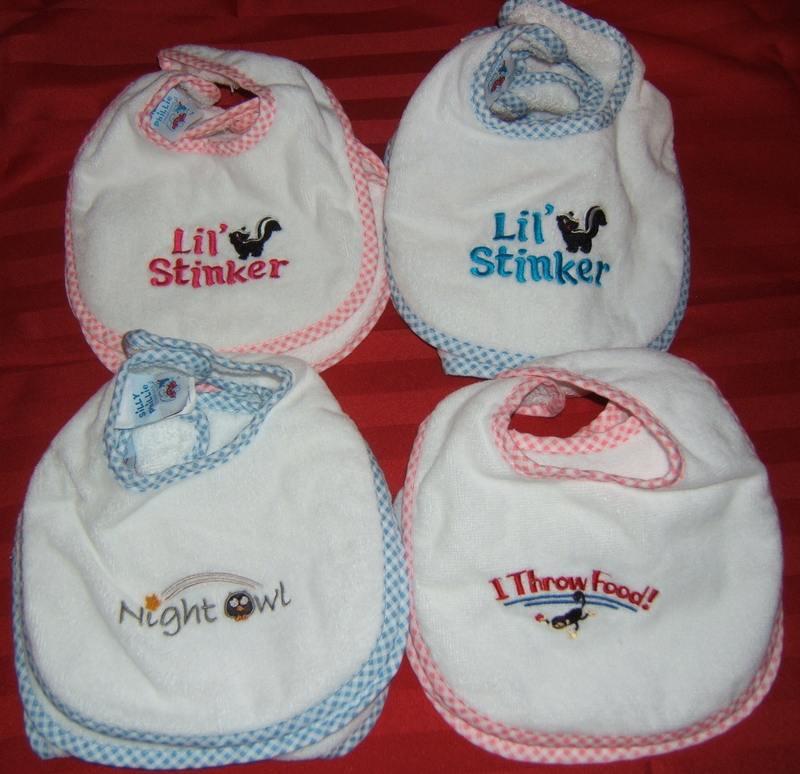 I purchased a bunch of burp cloths and bibs from All About Blanks a year ago in pink and blue trim. As I mentioned the other day I was having trouble embroidering the burp cloths, but I believe on Monday things were moving smoothly once again. 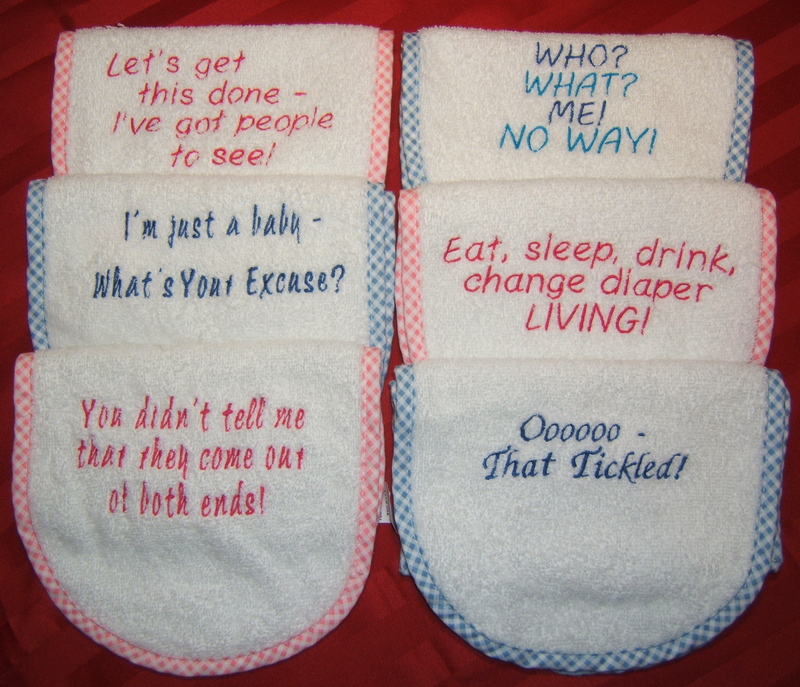 I finished all 12 of the burp cloths with 6 different sayings. I did some search engines on cute sayings and created three of my own. I wanted to make one that said “that was “wicked”, but I don’t know if people would be aware that the term “wicked” means neat/awesome. 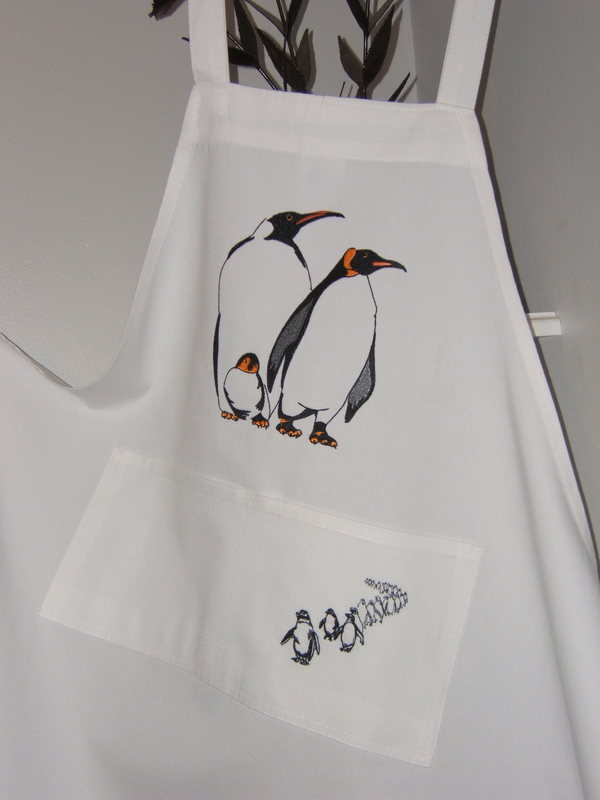 I then embroidered the bibs. I got the designs from, where else, EmbLibrary. These were simple and fast. 15 minutes top (even though I was not using the highest speed on my PR600). This is when I found out that my centering of the hoop is out of wack!!!! So this is how they turned out…. I only had to change the color on the Lil’ Stinker bibs so that they matched the trim. Made two of each bib in each color trim, so that I didn’t have to dig for more designs, even though I know I have them. I usually do gender specific on baby bibs, but not this time around. Time is the essence. Now as you know iPods come in colors, but time… so I stuck with the black and did six of these. I know they will be a hot seller. 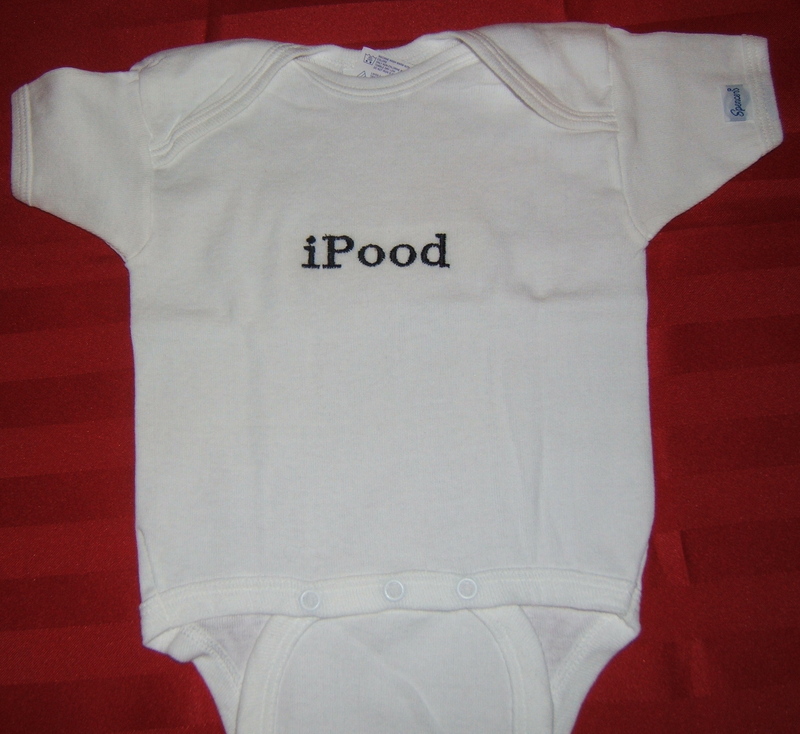 Thing is I still have 6 oneies left, 4 in blue, 2 in pink. Guess what, I am going to make colored iPoods’. I can’t believe how much these are sold on the internet. My oneies are mostly all “Gerber” items. These were so quick to do. I used my fast frames to stitch these out. I really do like those frames at times. I put iron on/tear away stabilizer right in the middle of the garment under the armpits. Only used a piece that was 1 1/2 inches by I think 4 inches. Then I attached it to the frame with double stick tape and made sure it was straight. Two minutes later it was done. Slapped the next one on and clicketyclak done! I had these done very fast. As soon as all where completed, I then took each one and used my Singer steam press to soften the stabilizer. With a twist of the wrist I riped the stabilizer off nice and clean! Then I took the mesh stabilizier, cut proper size and adhered it to the back of the stitching, so that it doesn’t errate the babies skin! Next project that I completed and told you about in previous post. 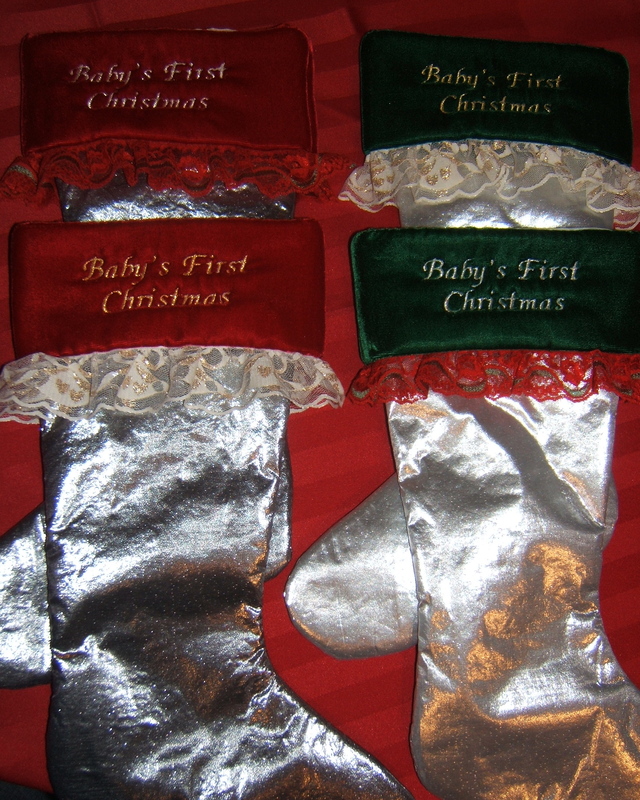 Photo isn’t great, but I was telling you about the vintage Christmas stockings my mom made. Well I put “Baby’s First Christmas” on the band and then I hand stitched lace on them. My mom really did a nice job putting these together. I decided to keep 2 of them for myself for my kids if they have kids. I was looking all over the place for where there might have been an opening so I could do the embroidery, but she did the stocking all together and then added the band last. If I didn’t indicate in my previous post – I hooped these on the fast frames, but I had to play with the size of the embroidery because of the size of the stocking and the frame. No matter how I tried, had to use the smallest frame you get in the set. I also did not use stabilizer (okay take your hand off your mouth). Hey when you start doing this for awhile, you find ways to maneuver around. When I first started out embroidering and I would hear someone say, oh I used a paper bag or a coffee liner, I would be the one covering up my mouth and say bad-bad. But you know, cost factor and experimental tests show you can use those items. I did not use either one for these – I used my plastic bag from the store. Then you can easily rip it off and well if needed (but I couldn’t on these), then iron off the excess plastic (as long as you cover with something so it doesn’t melt to your iron). Hmmm anything else for the little tykes… nope. Didn’t get a chance to do any receiving flannel or fleece blankets. I have to go to sewing club on Monday night to talk to a gal who made these fab baby blankets. They were two pieces of fabric and one side had a puppy applique on it. I can’t remember how she sewed the two together, but really nice and simple. Hi all. I received my Creative Machine Embroidery book for the month of November/December 2008. In the next few days I will be reviewing some items that are in the book. There is a free Holly Leaf design that you can download, a Frosty Pillow that you can get the pattern online, several unique gifts to make and where to purchase the designs and best of all PRIZES. Yes I am going to enter the John Deere Contest come November!!!! As always, we quickly thumb through a magazine and dismiss. Matter o’ fact, I was ready to put the magazine on the counter so it would go to the recyclables. Good thing I grabbed it and took my time the second time around. As a avid lover of Anita Goodesigns, there is a full page of 4 of their new sets. Actually there are more, but they could have come out in November. Dang, I wonder if Anita Goodesigns will have a sale on their sets at the Quilting & Sewing Expo in St. Charles, IL this upcoming week-end. I wasn’t planning on going so that I would save $$$. Will have to check with Aaron at DuPage Sew/Vac to see if he knows. I visited the Anita website, but they don’t have their new sets up, so instead I searched to see if anyone else might have them and I went to Erica’s website (http://www.ericas.com/embdesigns/anitagoodesign.htm). I wanted to post the designs for you to see. So here we go…. on two of the design sets I’ve uploaded what items come in the set because those are the ones I am interested in. I could live without the first design set posted but I think they are so adorable. I really do like the second set, but I don’t quilt, but doesn’t mean I can’t use the designs on other items, right! So click on the above link if you wish to look over the other sets and Erica’s site gives you the prices. Now as for the day’s accomplishments – whew! The elf was working hard and completed 15 baby bibs. I used designs from EmbLibrary and BFC. Sorry no pics right now cause I still have to rinse all the vilene off the bibs and dry them. Of course, as always, they are cute. 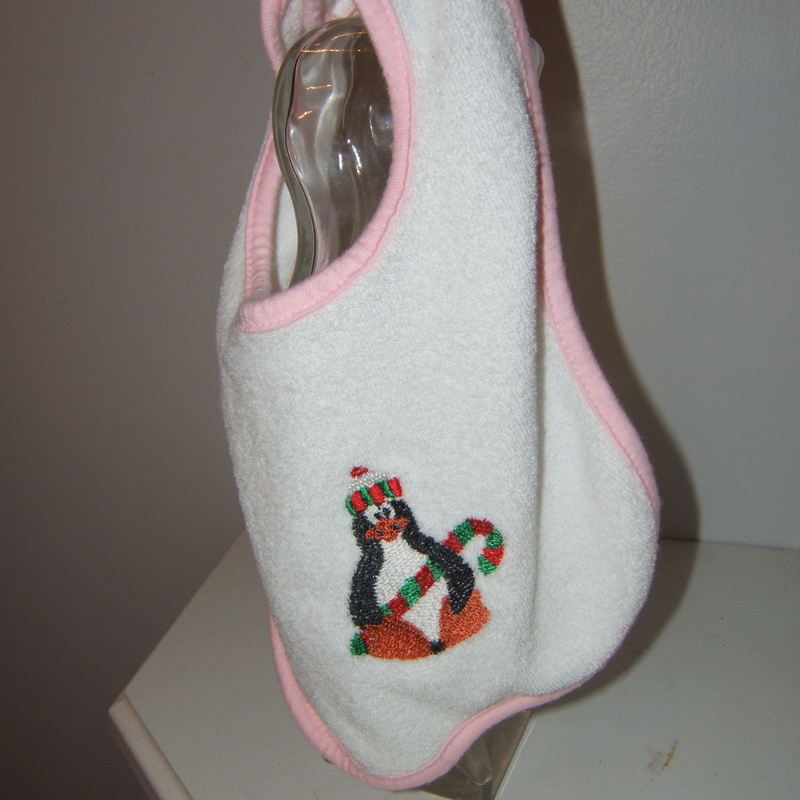 I really like the “Santa Baby” design, well I am a sucker for penquins too. On two of the designs they were ornaments and I used Embird to remove the areas I didn’t want to stitch. Now how many bibs did I destroy. Two, only two and I used up all my “HANES” bibs that I had. Maybe tomorrow I will see if I have anymore hiding somewhere. The day didn’t start off to good. My daughter awoke me when she got home from school. That was a good thing cause I didn’t fall asleep until at least 4 am, so sleeping til 9:30 am was nice. I wanted to make some lace monkeys first thing this morning. 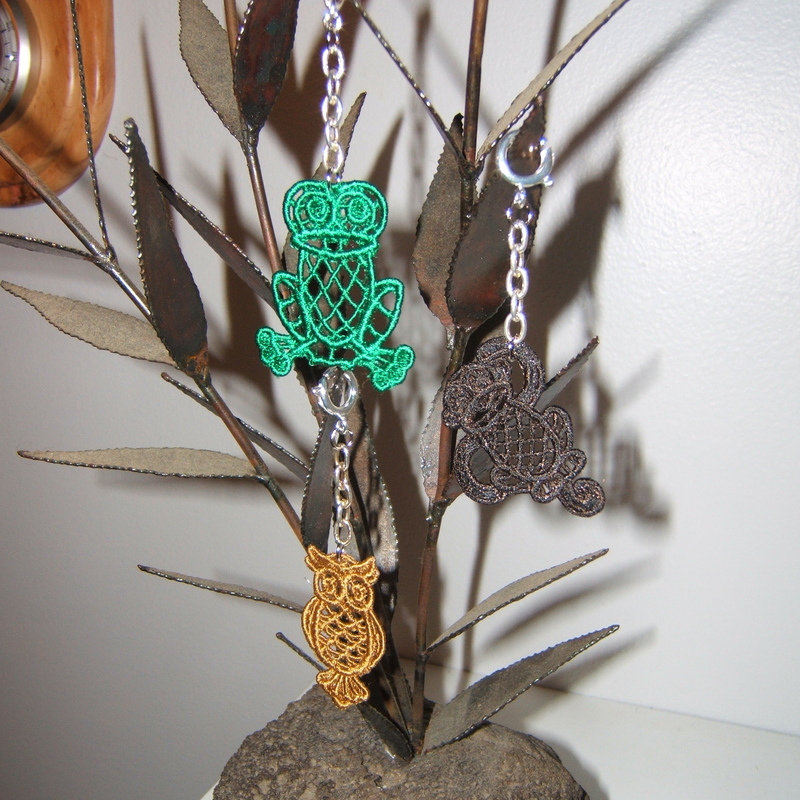 Last night I made 15 lace owls. I am connecting the lace item to a jump ring and then adding chain and a lobster claw. 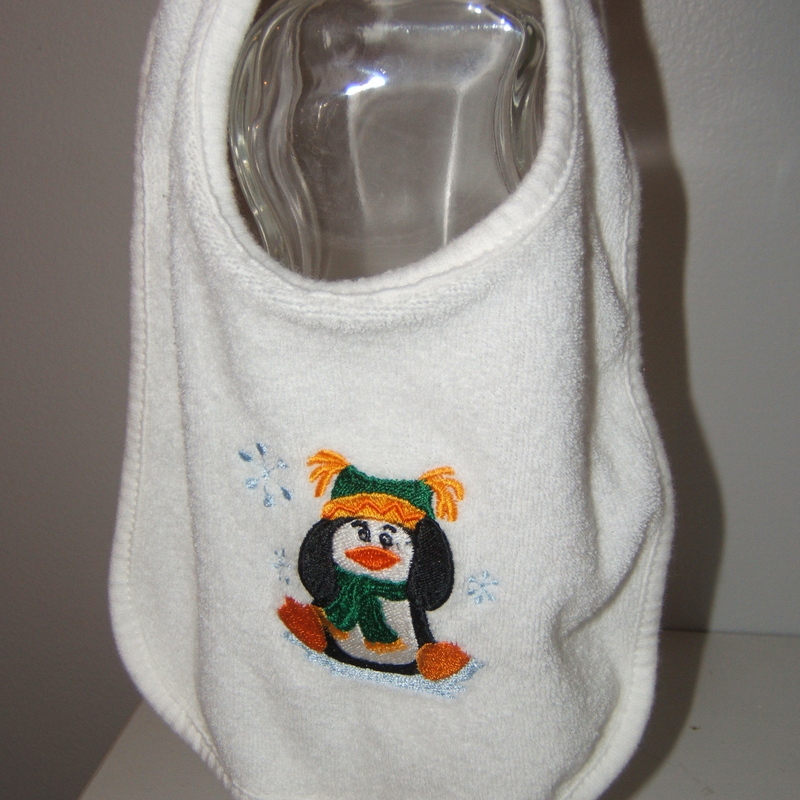 The item then can be used on a cell phone, purse zipper and main purpose, a child’s zippered coat. I have to add colorful eyes to the owls. Back to the monkeys I was suppose to be doing. Well the thread kept getting jammed, thus a bird’s nest. I ended up having to cut the thread in order to get the hoop off. I took out the nest and thought I had it all. Started up the machine and crap 4 monkeys later it started up again, but this time I had to take the cover off. So I take the cover off of my Brother PR600. I see that I have another nest hiding under the thread cutter. So I take my little brush (that is used for flossing) and clean the area good. Thought I had everything so I put the cover back on. Start up the machine and again cluster of thread. So I open it again and run the machine to see where the problem exists. I then unscrew the thread cutter areas. Clean under there and then put everything back together again. Still problems, so I decide to abort the monkeys! Thats when I switched to the bibs. Well things start going good and everything is working great until, dang its not working, the thread cutter. So I open it up again and look at the screen to see if I have both parts sitting correctly. Finally when I open it up, I notice a little metal circle sitting where it shouldn’t be. Dang that thing, last time this happened that little metal circle fell from the cutter and fell down into the bobbin shaft. I was so pissed! I was sweating bullets. Well I was today too cause I have a Holiday Craft Bazaar in a month and I want a lot on my table. I know I can’t call Aaron to do a house call cause of the expo this week, so I have to fix it myself. So I remember where this piece goes but I make sure I don’t drop it into the bobbin shaft! Put everything back together and then I start sewing again. Crap the design shifted and there is no way I will be able to get it on target. Put in a new bib and hit start. YEAH, its working. I am once again happy, but frustrated. I will have to call and have Aaron come and do a service call. Around 7ish my significant other comes and asks if I am going to be leaving my sewing room for the one downstairs. I told him eventually as I am cutting all the threads on the bibs and any jump stitches that are there. Now don’t get me wrong, I haven’t been in the sewing room all day, I’ve done some loads of wash, stripped the bed, made dinner, vacuumed and what else – grocery shopping, as my machine clicketyclaks away. Finally at 9:15 my last bib is done, but prior to being finished when I was in the room, the hoop slipped off. I wasn’t able to save the bib, but tried. I’ve been successful in the past in slipping the hoop back on and the design staying were it suppose to. Oh well. It was a productive day as far as I am concerned. Well I’ll be posting more information from Creative Machine Embroidery in the coming days, so keep in contact.